was required to file such reports) and (2) has been subject to such filing requirements for the last 90 days. in Rule 12b-2 of the Exchange Act. officers and directors are, in fact, affiliates of the Registrant. This annual report contains forward-looking statements. These statements relate to future events or our future financial performance. In some cases, you can identify forward-looking statements by terminology such as may, should, expects, plans, anticipates, believes, estimates, predicts, potential or continue or the negative of these terms or other comparable terminology. These statements are only predictions and involve known and unknown risks, uncertainties and other factors, including the risks in the section entitled Risk Factors, that may cause our or our industrys actual results, levels of activity, performance or achievements to be materially different from any future results, levels of activity, performance or achievements expressed or implied by these forward-looking statements. In this annual report, unless otherwise specified, all dollar amounts are expressed in United States Dollars and all references to common shares refer to the common shares in our capital stock. As used in this annual report, the terms we, us, our company, mean Wolverine Exploration Inc., a Nevada corporation, unless otherwise indicated. Our company was incorporated in the State of Nevada on February 23, 2006. On February 28, 2007, we entered into a vend-in agreement with Shenin Resources Inc., a private Canadian corporation, for the purchase of a 90% interest 516 mineral claims located in Labrador Canada. The purchase price paid to Shenin was $374,000 satisfied by the issuance of 34,000,000 shares of our common stock at a fair value of $0.01 per share and a note payable of $34,000. Under the terms of the vend-in agreement we are required to incur the following expenditures on the claims: (i) CDN $150,000 on or before March 1, 2008; (ii) CDN $200,000 on or before March 1, 2009, and (iii) CDN $250,000 on or before March 1, 2010; provided that (iv) any excess amount spent in one year may be carried forward and applied towards fulfillment of the expenditure required in the later year. Shenin has also granted our company a first right of refusal to purchase a 90% interest in all further property in Labrador Canada that Shenin may obtain an interest in from time to time. As of the date of this annual report, we have made the first payment of $250,000 and have paid $92,989 towards the second payment due March 1, 2009. To date, we have incurred expenditures of $244,593 (Cdn $242,989) pursuant to the terms of the vend-in agreement. On August 27, 2009 we signed an amending agreement with Shenin Resources Inc. which waives all of the remaining work commitments required under the vend-in agreement subject to us incurring sufficient exploration expenditures on the claims to keep them in good standing with the Province of Newfoundland and Labrador. On May 17, 2007, we acquired six mineral claims from Richard Haderer for $321 which are contiguous to the Shenin Claims. On August 15, 2007, we registered our company as an extra-provincially registered company in the Province of Newfoundland and Labrador for the purpose of being able to register the Shenin Claims and the Haderer Claims in the name of our company and for the purpose of being able to conduct our business in the Province of Newfoundland and Labrador. We are an exploration stage company engaged in the business of acquisition and exploration of base and precious metal mineral properties. Our current exploration is focused on the Shenin Claims and the Haderer Claims, mineral properties located in Labrador, Canada. We have not yet determined whether the Labrador Claims contain mineral reserves that are economically recoverable. The Shenin Claims and the Haderer Claims (collectively, the Labrador Claims) are located about 120 kilometres (75 miles) west of Goose Bay, Labrador, a small town of 9,000 people on the Atlantic Coast of northern Canada. It takes approximately one and a half to two hours to drive to the Labrador Claims from Goose Bay. The Labrador Claims lie within NTS map sheets 13E/01 and 13F/04 and extends approximately from 53o 11 08 N latitude and 62o 11 56 W longitude to 53o 06 34 N latitude and 61o 57 02 W longitude. Goose Bay features an international airport. From there, the Labrador Claims can be accessed directly from the Trans-Labrador Highway. The Labrador Claims are easily accessible by the Trans-Labrador Highway, which runs through the central portion of the Labrador Claims. The Trans-Labrador Highway is a well maintained Provincial Highway with a gravel surface. There are no gas stations between Goose Bay and Churchill Falls, the next major community located 290 kilometres (180 miles) to the west of Goose Bay and 160 kilometres (105 miles) to the west of the Labrador Claims. Access to the Labrador Claims is possible for most of the year given the proximity to Goose Bay and the fact that the highway is well maintained. Airborne geophysical surveys are best performed either in late winter (March-April) or during the summer (June-August). Ground geophysical surveys should be scheduled to avoid freeze-up (November-December) and breakup (late April to early June). Ground geological surveys are best conducted with no snow cover (mid June to mid November). Figure 1. The Claims are located approximately 120 kilometers (75 miles) west of Goose Bay, Labrador. The Labrador Claims are unencumbered and in good standing and there are no third party conditions which affect the Labrador Claims other than conditions defined by the Province of Newfoundland and Labrador described below. The Labrador Claims together make up an aggregate area of 33,482 acres. We have no insurance covering the Labrador Claims. Management believes that no insurance is necessary since the Labrador Claims are unimproved and contain no buildings or improvements. The Labrador Claims cover an area with approximate dimensions of 20 kilometers east-west (12.5 miles) and 10 kilometers north-south (6.25 miles). The Labrador Claims consist of a total of 522 mineral claims covering five separate licenses as described in Table 1 below. A layout of the Labrador Claims is shown in Figure 2 below. Table 1. Summary of the Claims. Figure 2. The Claims extend for a distance of approximately 20 kilometers (12.5 miles) along the Trans-Labrador Highway. There is no assurance that a commercially viable mineral deposit exists on the Labrador Claims. Further exploration will be required before an evaluation as to the economic feasibility of the Labrador Claims is determined. Our consulting geophysicist has written a report and provided us with recommendations of how we should explore the Labrador Claims. Until management can validate otherwise, the Labrador Claims are without known reserves. Management is planning a five phase exploration program as recommended by its consulting geophysicist. We have completed the first three phases of the exploration program on the Labrador Claims. The Labrador Claims have varying expiry dates. In order to maintain the Labrador Claims in good standing it will be necessary for us to coordinate an agent to perform and record valid exploration work with value of CDN$200 per claim in anniversary year 1, CDN$250 per claim in anniversary year 2, CDN$300 per claim in anniversary year 3, CDN$350 per claim in anniversary year 4, CDN$400 per claim in anniversary year 5, CDN$600 per claim in anniversary years six to ten inclusive, CDN$900 per claim in anniversary years 11 to 15 inclusive and CDN$1,200 per claim in anniversary years 16 to 20 inclusive. Failure to perform and record valid exploration work on the anniversary dates will result in forfeiture of title to the Labrador Claims. According to the report prepared by our consulting geophysicist, the geologic setting is based on information available from the Geological Survey of Canada (DNR Open File 013F/0055) and the Government of Newfoundland and Labrador (Open File 013F/0061). The regional geology as described by both Government Reports contains very little detail because the Trans-Labrador Highway was under construction during much of the mapping initiative, opening in 1992. Also, the area has seen only limited geologic mapping on a regional scale, in part due to the remoteness of the area and the timing of the Federal and Provincial mapping initiatives that preceded construction of the Trans-Labrador Highway. 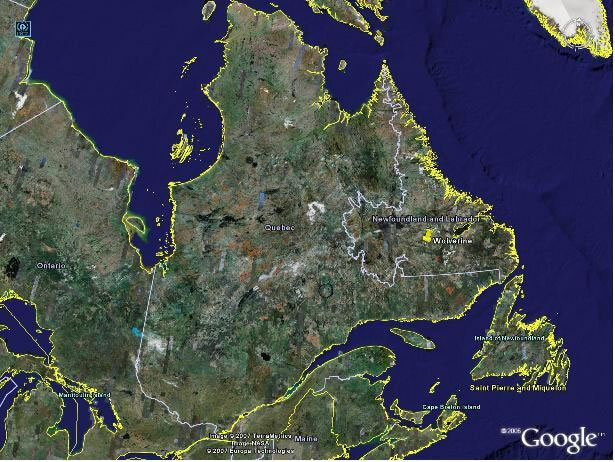 The mapped geology within the area is part of a regional 1:500,000 compilation undertaken by the Newfoundland and Labrador Provincial Government during the early 1990s. The survey area is located outside of the area of detailed mapping, in which case geologic mapping has been taken from previous publications, most notably a Federal Government regional mapping program from 1990-1994. During the period 1990 to 1994 the area was regionally mapped by the Geological Survey of Canada and by the Mines and Energy Branch of the Newfoundland and Labrador Government. Geologic mapping was performed on a very regional scale, due in part to the remoteness of the area (away from the Trans-Labrador Highway) and the lack of outcrop. In summary there is very little geological mapping within the survey area and there has never been a detailed mapping program. In 2002 the Labrador Claims were visited by Roderick Mercer on behalf of Tundra Properties. Mr. Mercer spent several days reviewing mineral showings along the Trans-Labrador Highway in an attempt to rediscover a mineralized sub-crop that had been exposed during road construction but later buried. The sub-crop was described as a gabbro containing pyrite, chalcopyrite and bornite mineralization. One sample returned 2% Cu and 0.5 g/t Au. Prospecting by Mr. Mercer did not find any similar mineralized showings in the area but did uncover several other showings along the Trans-Labrador Highway that returned significant values for copper when assayed. During the period October 15, 2004 and October 19, 2004 the Labrador Claims were revisited by Mr. Mercer on behalf of Tundra Properties. During this re-visit to the Labrador Claims, a trench was blasted to establish the extent of copper mineralization that had returned high assay values (3.3% Cu) during the 2002 program. Trenches were located in outcrop approximately 100 meters from the roadside mineralization. The trench area was grubbed off using an excavator. Holes were drilled to a maximum 4 meters below surface and were loaded with explosives and blasted. In total three separate areas were excavated and blasted. The trenches were inspected and sampled with assays returning up to 0.42% Cu. It could not be determined whether the area sampled was linked to the mineralization exposed along the roadside. Mr. Mercer concluded that the trenching program had failed to prove an extension to the roadside mineralization. It is also apparent, from reviewing Mr. Mercers Prospecting Report, that the lack of outcrop made it difficult to advance the prospect through a trenching program. The mineralization found to date on the Labrador Claims consists primarily of copper and gold mineralization in sulphide with associated pyrite (a non-economic sulphide mineral). There are also a number of malachite veins (and malachite stained outcrops). The country rocks have been identified as meta-sedimentary gneiss. Locally gabbros and diorites have been identified by surface prospecting. Based on the mineralization and the known geologic rock types, there appear to be three possible deposit types that could host mineralization within the Labrador Claims; 1) porphyry copper-gold in sulphide, 2) volcanogenic (Cu-Pb-Zn) massive sulphide, or 3) magmatic nickel-copper sulphide. Copper-gold (Cu-Au) deposits occur within sedimentary rocks when a stock intrudes into the sediments and heats up the ground water. The heated fluids pick up copper and other metals as they percolate through fractures opened up within the sediments. Mineralization is mostly disseminated, but significant veins of chalcopyrite, rich in gold, are also present. The presence of chalcopyrite in meta-sediment and malchite staining are excellent indicators for a copper-gold system. VMS deposits are commonly formed by deposition of hot metals into seawater from volcanic vents on the seafloor. The main metals include copper, zinc, lead, gold and silver. Within the Labrador Claims there are no mapped volcanic rocks, although the known mineralization has been found within gabbro and diorite. Magmatic nickel-copper sulphide deposits are hosted in mafic to ultramafic rocks such as gabbro, norite, and troctolite. Other rock types commonly associated with these host rocks are diorites and anorthosites. Within the Labrador Claims chalcopyrite mineralization was identified in a gabbro and separately associated with a diorite dyke. The Labrador Claims are almost completely covered by overburden and tree cover. Rock outcrops are best observed along the highway where they have been uncovered. The climate within the area is typically northern with short hot summers and long cold winters. Winter temperatures can range from -15o C to -35o C and occasionally fall to below -42o C.
There is no equipment, infrastructure or electricity currently on the Labrador Claims. There have been no previous airborne surveys in this area that are within 35 kilometers (22 miles) of the Labrador Claims. The area would have been covered as part of the Federal Government regional airborne magnetic survey, but this survey would not have the sufficient resolution to identify magnetic units less than 1 kilometer in size and could not detect any conductive mineralization. Geologically the area is mapped as early to late Proterozoic meta-sediments that have been metamorphosed to gneisses. Major gabbroic and anorthositic intrusives have intruded the gneisses several kilometers to the east and local gabbros and diorites occur throughout the area along with several quartz veins. Large tourmaline crystals have also been identified on the Labrador Claims. The area has little outcrop and is covered by overburden, generally sand and gravel. Spruces trees are abundant but are not very tall. Limited prospecting and surface trenching in 2002 and again in 2004 failed to define a source of the copper mineralization, although additional sub-crop samples were identified containing some copper and gold values. The presence of several copper showings and malachite staining in the limited outcrop suggests that a mineralizing event of copper and gold has intruded into the meta-sedimentary rocks. The nature of the mineralization is likely to be copper veins and disseminations with associated gold. It is also possible that magmatic nickel and copper mineralization could be present with associated platinum group elements within gabbros. The mining industry is intensely competitive. We compete with numerous individuals and companies, including many major mining companies, which have substantially greater technical, financial and operational resources and staffs. Accordingly, there is a high degree of competition for access to funds. There are other competitors that have operations in the area and the presence of these competitors could adversely affect our ability to compete for financing and obtain the service providers, staff or equipment necessary for the exploration and exploitation of our properties. Mining operations and exploration activities are subject to various national, state, provincial and local laws and regulations in Canada and the United States, as well as other jurisdictions, which govern prospecting, development, mining, production, exports, taxes, labor standards, occupational health, waste disposal, protection of the environment, mine safety, hazardous substances and other matters. We believe that we are and will continue to be in compliance in all material respects with applicable statutes and the regulations passed in Canada and the United States. There are no current orders or directions relating to our company with respect to the foregoing laws and regulations. Currently our only employees are our directors, officers, office administrator and an investor relations consultant. We do not expect any material changes in the number of employees over the next 12 month period. We do and will continue to outsource contract employment as needed. We anticipate that additional funding will be required in the form of equity financing from the sale of our common stock. At this time, we cannot provide investors with any assurance that we will be able to raise sufficient funding from the sale of our common stock or through a loan from our directors to meet our obligations over the next twelve months. We do not have any arrangements in place for any future equity financing. Much of the information included in this annual report includes or is based upon estimates, projections or other forward looking statements. Such forward looking statements include any projections and estimates made by us and our management in connection with our business operations. While these forward-looking statements, and any assumptions upon which they are based, are made in good faith and reflect our current judgment regarding the direction of our business, actual results will almost always vary, sometimes materially, from any estimates, predictions, projections, assumptions or other future performance suggested herein. If we do not obtain additional financing, the business plan will fail. Our current operating funds are insufficient to complete the next phases of our proposed exploration program on our Labrador mineral claims. We will need to obtain additional financing in order to complete our business plan and our proposed exploration program. Our business plan calls for significant expenses in connection with the exploration of the Labrador Claims. We have not made arrangements to secure any additional financing. Because we have only recently commenced business operations, we face a high risk of business failure and this could result in a total loss of your investment. 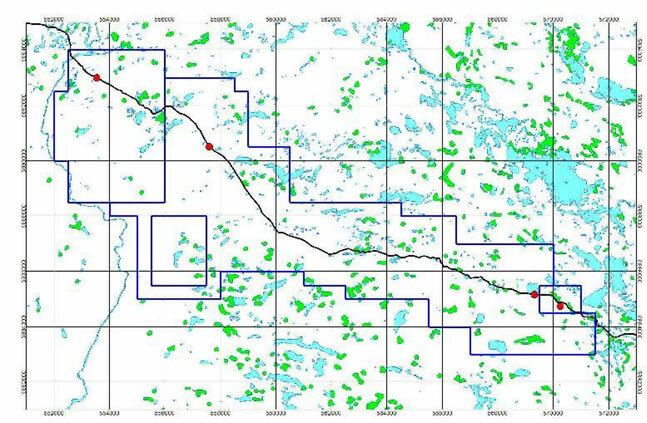 We recently begun the initial stages of exploration of the Labrador Claims, and thus has no way to evaluate the likelihood whether our company will be able to operate our business successfully. Our Company was incorporated on February 23, 2006 and to date we have been involved primarily in organizational activities, obtaining financing and preliminary exploration of the Labrador Claims. We have not earned any revenues and we have never achieved profitability as of the date of this annual report. Potential investors should be aware of the difficulties normally encountered by new mineral exploration companies and the high rate of failure of such enterprises. The likelihood of success must be considered in the light of problems, expenses, difficulties, complications and delays encountered in connection with the exploration of the mineral properties that our company plans to undertake. These potential problems include, but are not limited to, unanticipated problems relating to exploration and additional costs and expenses that may exceed current estimates. We have no history upon which to base any assumption as to the likelihood that its business will prove successful, and we can provide no assurance to investors that our company will generate any operating revenues or ever achieve profitable operations. If our company is unsuccessful in addressing these risks its business will likely fail and you will lose your entire investment in this offering. Because our company has only recently commenced business operations, we expect to incur operating losses for the foreseeable future. Our company has never earned any revenue and our company has never been profitable. Prior to completing exploration on the Labrador Claims, we may incur increased operating expenses without realizing any revenues from the Labrador Claims, this could cause our company to fail and you will lose your entire investment in this offering. If we do not find a joint venture partner for the continued development of our mineral claims, we may not be able to advance exploration work. If the results of the exploration program are successful, we may try to enter into a joint venture agreement with a partner for the further exploration and possible production of the Labrador Claims. Our company would face competition from other junior mineral resource exploration companies who have properties that they deem to be attractive in terms of potential return and investment cost. In addition, if our company entered into a joint venture agreement, our company would likely assign a percentage of our interest in the Labrador Claims to the joint venture partner. If our company is unable to enter into a joint venture agreement with a partner, our company may fail and you may lose your entire investment in this offering. Because of the speculative nature of mineral property exploration, there is substantial risk that no commercially viable deposits will be found and our business will fail. Exploration for base and precious metals is a speculative venture involving substantial risk. We can provide investors with no assurance that the Labrador Claims contain commercially viable mineral deposits. The exploration program that our company will conduct on the Labrador Claims may not result in the discovery of commercial viable mineral deposits. Problems such as unusual and unexpected rock formations and other conditions are involved in base and precious metal exploration and often result in unsuccessful exploration efforts. In such a case, we may be unable to complete our business plan and you could lose your entire investment. Because of the inherent dangers involved in base and precious metal exploration, there is a risk that our company may incur liability or damages as we conducts our business. The search for base and precious metals involves numerous hazards. As a result, our company may become subject to liability for such hazards, including pollution, cave-ins and other hazards against which we cannot insure or against which we may elect not to insure. Our company currently has no such insurance nor do we expect to get such insurance in the foreseeable future. If a hazard were to occur, the costs of rectifying the hazard may exceed our asset value and cause our company to liquidate all of our assets resulting in the loss of your entire investment. Because access to our companys mineral claims is often restricted by inclement weather, we will be delayed in exploration and any future mining efforts. Access to the Labrador mineral claims is restricted to the period between May and November of each year due to snow in the area. As a result, any attempts to visit, test, or explore the property are largely limited to these few months of the year when weather permits such activities. These limitations can result in significant delays in exploration efforts, as well as mining and production in the event that commercial amounts of minerals are found. Such delays can result in our companys inability to meet deadlines for exploration expenditures as defined by the Province of Newfoundland and Labrador or by the vend-in agreement with Shenin Resources Inc. This could cause the business venture to fail and the loss of your entire investment unless our company can meet the deadlines. As our company undertakes exploration of the Labrador Claims, we will be subject to compliance with government regulation that may increase the anticipated time and cost of its exploration program. There are several governmental regulations that materially restrict the exploration of minerals. Our company will be subject to the mining laws and regulations as contained in the Mineral Act of the Province of Newfoundland and Labrador as we carry out our exploration program. We may be required to obtain work permits, post bonds and perform remediation work for any physical disturbance to the land in order to comply with these regulations. While our companys planned exploration program budgets for regulatory compliance, there is a risk that new regulations could increase our time and costs of doing business and prevent our company from carrying out our exploration program. Because market factors in the mining business are out of our control, our company may not be able to market any minerals that may be found. The mining industry, in general, is intensely competitive and we can provide no assurance to investors even if minerals are discovered that a ready market will exist from the sale of any base or precious metals found. Numerous factors beyond our control may affect the marketability of base or precious metals. These factors include market fluctuations, the proximity and capacity of natural resource markets and processing equipment, government regulations, including regulations relating to prices, taxes, royalties, land tenure, land use, importing and exporting of minerals and environmental protection. The exact effect of these factors cannot be accurately predicted, but the combination of these factors may result in our company not receiving an adequate return on invested capital and you may lose your entire investment. Because our company holds a significant portion of our cash reserves in United States dollars, we may experience weakened purchasing power in Canadian dollar terms. Our company holds a significant portion of our cash reserves in United States dollars. Due to foreign exchange rate fluctuations, the value of these United States dollar reserves can result in both translation gains or losses in Canadian dollar terms. If there was to be a significant decline in the United States dollar versus the Canadian Dollar, our US dollar purchasing power in Canadian dollars would also significantly decline. Our company has not entered into derivative instruments to offset the impact of foreign exchange fluctuations. Our auditors have expressed substantial doubt about our companys ability to continue as a going concern. The accompanying financial statements have been prepared assuming that our company will continue as a going concern. As discussed in Note 1 to the financial statements, our company was incorporated on February 23, 2006, and does not have a history of earnings, and as a result, our companys auditor have expressed substantial doubt about the ability of our company to continue as a going concern. Continued operations are dependent on our ability to complete equity or debt financings or generate profitable operations. Such financings may not be available or may not be available on reasonable terms. Our financial statements do not include any adjustments that may result from the outcome of this uncertainty. Our stock is a penny stock. Trading of our stock may be restricted by the SECs penny stock regulations which may limit a stockholders ability to buy and sell our stock. Our stock is a penny stock. The Securities and Exchange Commission has adopted Rule 15g-9 which generally defines penny stock to be any equity security that has a market price (as defined) less than $5.00 per share or an exercise price of less than $5.00 per share, subject to certain exceptions. Our securities are covered by the penny stock rules, which impose additional sales practice requirements on broker-dealers who sell to persons other than established customers and accredited investors. The term accredited investor refers generally to institutions with assets in excess of $5,000,000 or individuals with a net worth in excess of $1,000,000 or annual income exceeding $200,000 or $300,000 jointly with their spouse. The penny stock rules require a broker-dealer, prior to a transaction in a penny stock not otherwise exempt from the rules, to deliver a standardized risk disclosure document in a form prepared by the SEC which provides information about penny stocks and the nature and level of risks in the penny stock market. The broker-dealer also must provide the customer with current bid and offer quotations for the penny stock, the compensation of the broker-dealer and its salesperson in the transaction and monthly account statements showing the market value of each penny stock held in the customers account. The bid and offer quotations, and the broker-dealer and salesperson compensation information, must be given to the customer orally or in writing prior to effecting the transaction and must be given to the customer in writing before or with the customers confirmation. In addition, the penny stock rules require that prior to a transaction in a penny stock not otherwise exempt from these rules, the broker-dealer must make a special written determination that the penny stock is a suitable investment for the purchaser and receive the purchasers written agreement to the transaction. These disclosure requirements may have the effect of reducing the level of trading activity in the secondary market for the stock that is subject to these penny stock rules. Consequently, these penny stock rules may affect the ability of broker-dealers to trade our securities. We believe that the penny stock rules discourage investor interest in and limit the marketability of our common stock. Without a public market there is no liquidity for our shares and our shareholders may never be able to sell their shares which would result in a total loss of their investment. We will have to be current in our financial statements to be quoted on the OTCBB and hence we will be responsible for filing Forms 10-K and 10-Q on a periodic basis as required. We have identified a market maker and have commenced the process of being quoted on the OTCBB. The length of time this will take is unknown to us but we estimate approximately two to four weeks. There is the distinct possibility that our company will never be quoted on the OTCBB. We do not own any real property. Our principal business offices are located at 4055 McLean Road, Quesnel, British Columbia Canada V2J 6V5. Our office space is currently provided by a relative of a director of our company at a cost of Cdn$25 per month. We believe that our current lease arrangements provide adequate space for our foreseeable future needs. In addition, Cdn $1,000 per month is paid to Texada Consulting Inc. for an administrative office located in Richmond, BC. Texada Consulting Inc. is controlled by a major shareholder of the Company. Other than as set out below, our company is not a party to any pending legal proceeding and no legal proceeding is contemplated or threatened as of the date of this annual report. There were no matters submitted to a vote of our security holders either through solicitation of proxies or otherwise in the fourth quarter of the fiscal year ended May 31, 2009. There is presently no public market for our common stock. We have identified a market maker and have commenced the process of being quoted on the OTCBB. However, we can provide no assurance that our shares will be traded on the OTCBB or, if traded, that a public market will materialize. As of the date of this annual report, we have 132 registered shareholders. We have not declared any dividends, and we do not plan to declare any dividends in the foreseeable future. We currently do not have any stock option or equity compensation plans or arrangements. Our common shares are issued in registered form. Empire Stock Transfer, Inc. (Telephone: (702) 818-5898; Facsimile: (702) 974-1444 is the registrar and transfer agent for our common shares. On September 29, 2009, the list of stockholders for our shares of common stock showed 132 registered stockholders and 68,630,000 shares of common stock outstanding. We did not purchase any of our shares of common stock or other securities during the year ended May 31, 2009. On June 25, 2008, Wolverine issued an aggregate of 1,100,000 shares of common stock to eight (8) non-affiliate non U.S. persons (as that term is defined in Regulation S of the Securities Act of 1933) in an offshore transaction relying on Regulation S and/or Section 4(2) of the Securities Act of 1933 and three (3) non-affiliate U.S. persons (as that term is defined in Regulation S of the Securities Act of 1933) in reliance upon the exemptions from registration provided by Section 4(2) of the Securities Act of 1933 and upon Rule 506 of Regulation D of the Securities Act of 1933, at a price of $0.10 per share for aggregate cash proceeds of $110,000. We did not purchase any of our shares of common stock or other securities during our fourth quarter of our fiscal year ended May 31, 2009. The following discussion should be read in conjunction with our audited financial statements and the related notes for the years ended May 31, 2009 and May 31, 2008 that appear elsewhere in this annual report. The following discussion contains forward-looking statements that reflect our plans, estimates and beliefs. Our actual results could differ materially from those discussed in the forward looking statements. Factors that could cause or contribute to such differences include, but are not limited to those discussed below and elsewhere in this annual report, particularly in the section entitled "Risk Factors" beginning on page 10 of this annual report. There is limited historical financial information about us upon which to base an evaluation of our performance. We are an exploration stage company and have not generated any revenues from activities. We cannot guarantee we will be successful in our business activities. Our business is subject to risks inherent in the establishment of a new business enterprise, including limited capital resources, possible delays in the exploration of our properties, and possible cost overruns due to price and cost increases in services. Over the next twelve months we intend to use any funds that we may have available to fund our operations and conduct exploration on our Shenin and Haderer Claims. We expect to review other potential exploration projects from time to time as they are presented to us. capital or that actual cash requirements will not exceed our estimates. We intend to fulfill any additional cash requirement through the sale of our equity securities. Our auditors have issued a going concern opinion for our year ended May 31, 2009. This means that there is substantial doubt that we can continue as an on-going business for the next twelve months unless we obtain additional capital to pay our bills. This is because we have not generated any revenues and no revenues are anticipated until we begin removing and selling minerals. As we had cash in the amount of $673 and a working capital deficit in the amount of $352,421 as of May 31, 2009, we do not have sufficient working capital to enable us to carry out our stated plan of operation for the next twelve months. We plan to complete debt financings and/or private placement sales of our common stock in order to raise the funds necessary to pursue our plan of operation and to fund our working capital deficit in order to enable us to pay our accounts payable and accrued liabilities. We currently do not have any arrangements in place for the completion of any debt financings or private placement financings and there is no assurance that we will be successful in completing any debt financing or private placement financing. Our success or failure will be determined by what we find under the ground. Our plan of operation for the next 12 months is to complete the following five phase exploration program within the time periods specified, subject to our company obtaining the additional funding necessary for the continued exploration of the Labrador Claims. Currently, our company does not have enough funds to complete Phase Four of our proposed exploration program in the fall of 2009. The following is a brief summary of our five phase exploration program. Phase One  This phase of our companys exploration program was completed in October 2007 at a cost of $7,012 (CDN$7,500). Phase one consisted of prospecting, rock sampling, and assaying the rock samples. As a result of the favorable results from this phase of the exploration program, management decided to proceed with phase two. Phase Two - This phase of our companys exploration program was completed in October 2007 at a cost of $187,915 (CDN$201,000). Phase two consisted of an airborne survey of the Labrador Claims. As a result of the favorable results from this phase of the exploration program, management decided to proceed with phase three. Phase Three  This phase of our company exploration program consisted of a preliminary ground review completed in August 2008 by the project geologist, Ed Montague and a member of the Innu Development Limited Partnership. A second year assessment report was completed and filed with the Department of Natural Resources of the Province of Newfoundland and Labrador. As a result of favorable results from this phase of the exploration program, management has decided to proceed with phase four. Phase Four  This phase of our companys exploration program will consist of prospecting, sampling, excavating and trenching as outlined below at a total estimated cost of approximately $146,000 (Cdn $166,000). Phase Five- Subject to positive results in phase four this phase of our companys exploration program will consist of an IP survey (Induced Polarization Survey) over anomalies identified in the phase two airborne survey to determine drill locations for a drill program at a total estimated cost of $350,000 (Cdn $400,000). ground disturbance such as test pits or trenching is contemplated, no government permits would be required for this prospecting program. The project also consists of excavating several trenches located on 6 anomalous areas that were defined previously by airborne geophysics. The number and locations of trenches will be defined by the geologist. All trench locations will be located in close proximity to the Trans Labrador Highway (Route 500) near Cache River, 110 to 140 kilometers west of Goose Bay. Excavation of the trenches will be done by an excavator. Once the rock is exposed, a pressure washer will clean the surface and then examined and sampled by a geologist. Sampling would ideally be a continuous linear v cut with a rock saw to get a composite sample. A small, packsack type drill will also be available to get core samples at depth. The exposed bedrock will be mapped and photographed by the geologist. Sampling of the linear cuts will be in meter length sections. IDLP is purchasing a small packsack drill that will be utilized to get core samples at a depth of a few feet to get below any weathering and into the fresh rock. Core samples sections will be as directed by the geologist. All samples will be numbered and packaged and sent to a laboratory for analysis. All samples will be tested for IPC 30 elements as well as gold and PGEs. All of the samples will be scanned with a scintillometer for uranium content. The equipment and personnel required to implement the work will be contracted out of Goose Bay, the nearest community to the project. Government regulations stipulate that all exploration trenches be backfilled as soon as possible after examination. This will be done prior to demobilization of the heavy equipment. As at May 31, 2009, we had a cash balance of $673. We will need to raise additional financing to fund phase four of the proposed exploration program to commence in fall 2009 and subject to positive results in phase four additional financing for phase five of the proposed exploration program to commence in 2010. The continuation of our business is dependent upon obtaining further financing, a successful program of exploration and/or development, and, finally, achieving a profitable level of operations. The issuance of additional equity securities by us could result in a significant dilution in the equity interests of our current stockholders. Obtaining commercial loans, assuming those loans would be available, will increase our liabilities and future cash commitments. There are no assurances that we will be able to obtain further funds required for our continued operations. As noted herein, we are pursuing various financing alternatives to meet our immediate and long-term financial requirements. There can be no assurance that additional financing will be available to us when needed or, if available, that it can be obtained on commercially reasonable terms. If we are not able to obtain the additional financing on a timely basis, we will be unable to conduct our operations as planned, and we will not be able to meet our other obligations as they become due. In such event, we will be forced to scale down or perhaps even cease our operations. We do intend to purchase mineral ore processing equipment over the twelve months ending May 31, 2010. The following summary of our results of operations should be read in conjunction with our audited financial statements for the years ended May 31, 2009 and 2008. The decrease in operating expenses comprised of general and administrative expenses and mineral exploration costs, for the year ended May 31, 2009, compared to the same period in fiscal 2008, was mainly due to a lack of funds available which can be attributed to the current economic conditions. The Company also wrote-off all of its mineral property costs which had been incurred since inception due to the uncertainty of establishing proven and probable reserves. Net cash used in operating activities during the year ended May 31, 2009, was $53,643 compared to $576,036 during the year ended May 31, 2008. We did not have any investing activities during the years ended May 31, 2009 and May 31, 2008. During the year ended May 31, 2009, we received a $36,000 loan. During the year ended May 31, 2008, we received net proceeds of $612,400 from share subscriptions and repaid $28,414 to a related party. Our audited financial statements and accompanying notes are prepared in accordance with generally accepted accounting principles used in the United States. Preparing financial statements requires management to make estimates and assumptions that affect the reported amounts of assets, liabilities, revenue, and expenses. These estimates and assumptions are affected by management's application of accounting policies. We believe that understanding the basis and nature of the estimates and assumptions involved with the following aspects of our financial statements is critical to an understanding of our financials. Our company has been in the exploration stage since its inception on February 23, 2006 and has not yet realized any revenues from its planned operations. It is primarily engaged in the acquisition and exploration of mining properties. Mineral property exploration costs are expensed as incurred. Mineral property acquisition costs are initially capitalized when incurred using the guidance in EITF 04-02, Whether Mineral Rights Are Tangible or Intangible Assets. Our company assesses the carrying costs for impairment under SFAS No. 144, Accounting for Impairment or Disposal of Long Lived Assets at each fiscal quarter end. When it has been determined that a mineral property can be economically developed as a result of establishing proven and probable reserves, the costs then incurred to develop such property, are capitalized. Such costs will be amortized using the units-of-production method over the estimated life of the probable reserve. If mineral properties are subsequently abandoned or impaired, any capitalized costs will be charged to operations. the carrying amount of the asset and its fair value which is generally determined based on the sum of the undiscounted cash flows expected to result from the use and the eventual disposal of the asset, as well as specific appraisal in certain instances. An impairment loss is recognized when the carrying amount is not recoverable and exceeds fair value. Our company records stock-based compensation in accordance with SFAS No. 123R, Share Based Payments, using the fair value method. All transactions in which goods or services are the consideration received for the issuance of equity instruments are accounted for based on the fair value of the consideration received or the fair value of the equity instrument issued, whichever is more reliably measurable. In June 2009, the Financial Accounting Standards Board (FASB) issued SFAS No. 168, The FASB Accounting Standards Codification and the Hierarchy of Generally Accepted Accounting Principles  a replacement of FASB Statement No. 162. The FASB Accounting Standards Codification (Codification) will become the source of authoritative U.S. generally accepted accounting principles (GAAP) recognized by FASB to be applied by nongovernmental entities. Rules and interpretive releases of the Securities and Exchange Commission SEC under authority of federal securities laws are also sources of authoritative GAAP for SEC registrants. On the effective date of this statement, the Codification will supersede all then-existing non-SEC accounting and reporting standards. All other non-grandfathered non-SEC accounting literature not included in the Codification will become non-authoritative. This statement is effective for financial statements issued for interim and annual periods ending after September 30, 2009. The adoption of this statement is not expected to have a material effect on our companys financial statements. In June 2009, the FASB issued SFAS No. 167, Amendments to FASB Interpretation No. 46(R). The objective of this statement is to improve financial reporting by enterprises involved with variable interest entities. This statement addresses (1) the effects on certain provisions of FASB Interpretation No. 46 (revised December 2003), Consolidation of Variable Interest Entities, as a result of the elimination of the qualifying special-purpose entity concept in SFAS No. 166, Accounting for Transfers of Financial Assets, and (2) concern about the application of certain key provisions of FASB Interpretation No. 46(R), including those in which the accounting and disclosures under the Interpretation do not always provide timely and useful information about an enterprises involvement in a variable interest entity. This statement is effective as of the beginning of each reporting entitys first annual reporting period that begins after November 15, 2009, for interim periods within that first annual reporting period, and for interim and annual reporting periods thereafter. Earlier application is prohibited. The adoption of this statement is not expected to have a material effect on our companys financial statements. In June 2009, the FASB issued SFAS No. 166, Accounting for Transfers of Financial Assets  an amendment of FASB No. 140. The object of this statement is to improve the relevance, representational faithfulness, and comparability of the information that a reporting entity provides in its financial statements about a transfer of financial assets; the effects of a transfer on its financial position, financial performance, and cash flows; and a transferors continuing involvement, if any, in transferred financial assets. This statement addresses (1) practices that have developed since the issuance of SFAS No. 140, Accounting for Transfers and Servicing of Financial Assets and Extinguishments of Liabilities, that are not consistent with the original intent and key requirements of that statement and (2) concerns of financial statement users that many of the financial assets (and related obligations) that have been derecognized should continue to be reported in the financial statements of transferors. SFAS No. 166 must be applied as of the beginning of each reporting entitys first annual reporting period that begins after November 15, 2009, for interim periods within that first annual reporting period and for interim and annual reporting periods thereafter. Earlier application is prohibited. This statement must be applied to transfers occurring on or after the effective date. Additionally, on and after the effective date, the concept of a qualifying special-purpose entity is no longer relevant for accounting purposes. The disclosure provisions of this statement should be applied to transfers that occurred both before and after the effective date of this statement. The adoption of this statement is not expected to have a material effect on our companys financial statements. issued or are available to be issued. SFAS No. 165 is to be applied to interim and annual financial periods ending after June 15, 2009. The adoption of this statement is not expected to have a material effect on our companys financial statements. In May 2008, the FASB issued SFAS No. 163, Accounting for Financial Guarantee Insurance Contracts  An interpretation of FASB Statement No. 60. SFAS No. 163 requires that an insurance enterprise recognize a claim liability prior to an event of default when there is evidence that credit deterioration has occurred in an insured financial obligation. It also clarifies how Statement 60 applies to financial guarantee insurance contracts, including the recognition and measurement to be used to account for premium revenue and claim liabilities, and requires expanded disclosures about financial guarantee insurance contracts. It is effective for financial statements issued for fiscal years beginning after December 15, 2008, except for some disclosures about the insurance enterprises risk-management activities. SFAS No. 163 requires that disclosures about the risk-management activities of the insurance enterprise be effective for the first period beginning after issuance. Except for those disclosures, earlier application is not permitted. The adoption of this statement is not expected to have a material effect on our companys financial statements. In May 2008, the FASB issued SFAS No. 162, The Hierarchy of Generally Accepted Accounting Principles. SFAS No. 162 identifies the sources of accounting principles and the framework for selecting the principles to be used in the preparation of financial statements of nongovernmental entities that are presented in conformity with generally accepted accounting principles in the United States. SFAS No. 162 became effective on November 13, 2008 following the SECs approval of the Public Company Accounting Oversight Board amendments to AU Section 411, The Meaning of Present Fairly in Conformity With Generally Accepted Accounting Principles. The adoption of this statement did not have a material effect on our companys financial statements. In March 2008, the FASB issued SFAS No. 161, Disclosures about Derivative Instruments and Hedging Activities  an amendment to FASB Statement No. 133. SFAS No. 161 is intended to improve financial standards for derivative instruments and hedging activities by requiring enhanced disclosures to enable investors to better understand their effects on an entity's financial position, financial performance, and cash flows. Entities are required to provide enhanced disclosures about: (a) how and why an entity uses derivative instruments; (b) how derivative instruments and related hedged items are accounted for under Statement 133 and its related interpretations; and (c) how derivative instruments and related hedged items affect an entitys financial position, financial performance, and cash flows. It is effective for financial statements issued for fiscal years beginning after November 15, 2008, with early adoption encouraged. The adoption of this statement is not expected to have a material effect on our companys financial statements. In December 2007, FASB issued SFAS No. 141 (revised 2007), Business Combinations. This statement replaces SFAS No. 141 and defines the acquirer in a business combination as the entity that obtains control of one or more businesses in a business combination and establishes the acquisition date as the date that the acquirer achieves control. SFAS No. 141 (revised 2007) requires an acquirer to recognize the assets acquired, the liabilities assumed, and any noncontrolling interest in the acquiree at the acquisition date, measured at their fair values as of that date. SFAS No. 141 (revised 2007) also requires the acquirer to recognize contingent consideration at the acquisition date, measured at its fair value at that date. This statement is effective for fiscal years, and interim periods within those fiscal years, beginning on or after December 15, 2008 and earlier adoption is prohibited. The adoption of this statement is not expected to have a material effect on our company's financial statements. In December 2007, the FASB issued SFAS No. 160, Noncontrolling Interests in Consolidated Financial Statements Liabilities an Amendment of ARB No. 51. This statement amends ARB 51 to establish accounting and reporting standards for the Noncontrolling interest in a subsidiary and for the deconsolidation of a subsidiary. This statement is effective for fiscal years, and interim periods within those fiscal years, beginning on or after December 15, 2008 and earlier adoption is prohibited. The adoption of this statement is not expected to have a material effect on our company's financial statements. Our audited financial statements are stated in United States dollars (US$) and are prepared in accordance with United States Generally Accepted Accounting Principles. We have audited the accompanying balance sheet of Wolverine Exploration Inc. (An Exploration Stage Company) as of May 31, 2009, and the related statements of operations, stockholders equity (deficit), and cash flows for the year then ended and accumulated from June 1, 2008 to May 31, 2009. These financial statements are the responsibility of the Company's management. Our responsibility is to express an opinion on these financial statements based on our audit. We conducted our audit in accordance with the standards of the Public Company Accounting Oversight Board (United States). Those standards require that we plan and perform the audit to obtain reasonable assurance about whether the financial statements are free of material misstatement. An audit includes examining, on a test basis, evidence supporting the amounts and disclosures in the financial statements. The Company is not required to have, nor were we engaged to perform, an audit of its internal control over financial reporting. An audit includes consideration of internal control over financial reporting as a basis for designing audit procedures that are appropriate in the circumstances, but not for the purpose of expressing an opinion on the effectiveness of internal control over financial reporting. Accordingly, we express no such opinion. An audit also includes assessing the accounting principles used and significant estimates made by management, as well as evaluating the overall financial statement presentation. We believe that our audit provides a reasonable basis for our opinion. In our opinion, the financial statements referred to above present fairly, in all material respects, the financial position of the Company as of May 31, 2009, and the results of its operations and its cash flows for the year then ended and accumulated from June 1, 2008 to May 31, 2009, in conformity with accounting principles generally accepted in the United States. The accompanying financial statements have been prepared assuming the Company will continue as a going concern. As discussed in Note 1 to the financial statements, the Company has not generated any revenues, has a working capital deficit, and has incurred operating losses since inception. These factors raise substantial doubt about the Companys ability to continue as a going concern. Managements plans in regard to these matters are also discussed in Note 1 to the financial statements. The financial statements do not include any adjustments that might result from the outcome of this uncertainty. We have audited the accompanying balance sheet of Wolverine Exploration Inc. (an exploration stage company) as of May 31, 2008, and the related statements of operations, stockholders equity and cash flows for the year then ended and for the period from inception (February 23, 2006) through May 31, 2008. These financial statements are the responsibility of the Companys management. Our responsibility is to express an opinion on these financial statements based on our audit. We conducted our audit in accordance with the standards of the Public Company Accounting Oversight Board (United States). Those standards require that we plan and perform the audit to obtain reasonable assurance about whether the financial statements are free of material misstatement. The Company is not required to have, nor were we engaged to perform, an audit of its internal control over financial reporting. Our audit included consideration of internal control over financial reporting as a basis for designing audit procedures that are appropriate in the circumstances, but not for the purpose of expressing an opinion on the effectiveness of the Companys internal control over financial reporting. Accordingly, we express no such opinion. An audit includes examining, on a test basis, evidence supporting the amounts and disclosures in the financial statements. An audit also includes assessing the accounting principles used and significant estimates made by management, as well as evaluating the overall financial statement presentation. We believe that our audit provides a reasonable basis for our opinion. In our opinion, the financial statements referred to above present fairly, in all material respects, the financial position of Wolverine Exploration Inc. as of May 31, 2008, and the results of its operations and its cash flows for the year then ended and for the period from inception (February 23, 2006) through May 31, 2008 in conformity with accounting principles generally accepted in the United States of America. The accompanying financial statements have been prepared assuming that the Company will continue as a going concern. As more fully described in Note 1, the Company has incurred recurring operating losses and has an accumulated deficit. These conditions raise substantial doubt about the Companys ability to continue as a going concern. Managements plans in regard to these matters are also described in Note 1. The financial statements do not include any adjustments to reflect the possible future effects on the recoverability and classification of assets or the amounts and classification of liabilities that may result from the outcome of this uncertainty. The Company was incorporated in the State of Nevada on February 23, 2006. The Company is an Exploration Stage Company, as defined by Statement of Financial Accounting Standard (SFAS) No. 7, Accounting and Reporting by Development Stage Enterprises. The Companys principal business is the acquisition and exploration of mineral resources. The Company has not presently determined whether its properties contain mineral reserves that are economically recoverable. These financial statements have been prepared on a going concern basis, which implies the Company will continue to realize its assets and discharge its liabilities in the normal course of business. The Company has never generated revenues since inception and is unlikely generate earnings in the immediate or foreseeable future. The continuation of the Company as a going concern is dependent upon the continued financial support from its shareholders, the ability of the Company to obtain necessary equity financing to continue operations, and the attainment of profitable operations. As at May 31, 2009, the Company has a working capital deficiency of $352,421 and has accumulated losses of $1,451,821 since inception. These factors raise substantial doubt regarding the Companys ability to continue as a going concern. These financial statements do not include any adjustments to the recoverability and classification of recorded asset amounts and classification of liabilities that might be necessary should the Company be unable to continue as a going concern. In addition to funding our working capital deficit, we require additional funds of $496,000 to proceed with our plan of operation over the next twelve months. Management is currently seeking additional financing through the sale of equity and from borrowings from private lenders to cover its operating expenditures. There can be no certainty that these sources will provide the additional funds required for the next twelve months. These financial statements and related notes are presented in accordance with accounting principles generally accepted in the United States, and are expressed in U.S. dollars. The Companys fiscal year-end is May 31. The preparation of financial statements in accordance with accounting principles generally accepted in the United States requires management to make estimates and assumptions that affect the reported amounts of assets and liabilities at the date of the financial statements and the reported amounts of revenue and expenses in the reporting period. The Company regularly evaluates estimates and assumptions related to the recoverability of mineral property costs and deferred income tax asset valuation allowances. The Company bases its estimates and assumptions on current facts, historical experience and various other factors that it believes to be reasonable under the circumstances, the results of which form the basis for making judgments about the carrying values of assets and liabilities and the accrual of costs and expenses that are not readily apparent from other sources. The actual results experienced by the Company may differ materially and adversely from the Companys estimates. To the extent there are material differences between the estimates and the actual results, future results of operations will be affected. The Company has been in the exploration stage since its inception on February 23, 2006 and has not yet realized any revenues from its planned operations. It is primarily engaged in the acquisition and exploration of mining properties. Mineral property exploration costs are expensed as incurred. Mineral property acquisition costs are initially capitalized when incurred using the guidance in EITF 04-02, Whether Mineral Rights Are Tangible or Intangible Assets. The Company assesses the carrying costs for impairment under SFAS No. 144, Accounting for Impairment or Disposal of Long Lived Assets at each fiscal quarter end. When it has been determined that a mineral property can be economically developed as a result of establishing proven and probable reserves, the costs then incurred to develop such property, are capitalized. Such costs will be amortized using the units-of-production method over the estimated life of the probable reserve. If mineral properties are subsequently abandoned or impaired, any capitalized costs will be charged to operations. In accordance with SFAS No. 144, Accounting for the Impairment or Disposal of Long-Lived Assets, the Company tests long-lived assets or asset groups for recoverability when events or changes in circumstances indicate that their carrying amount may not be recoverable. Circumstances which could trigger a review include, but are not limited to: significant decreases in the market price of the asset; significant adverse changes in the business climate or legal factors; accumulation of costs significantly in excess of the amount originally expected for the acquisition or construction of the asset; current period cash flow or operating losses combined with a history of losses or a forecast of continuing losses associated with the use of the asset; and current expectation that the asset will more likely than not be sold or disposed significantly before the end of its estimated useful life. Recoverability is assessed based on the carrying amount of the asset and its fair value which is generally determined based on the sum of the undiscounted cash flows expected to result from the use and the eventual disposal of the asset, as well as specific appraisal in certain instances. An impairment loss is recognized when the carrying amount is not recoverable and exceeds fair value. The Company follows the provisions of SFAS No. 143, Accounting for Asset Retirement Obligations, which establishes standards for the initial measurement and subsequent accounting for obligations associated with the sale, abandonment or other disposal of long-lived tangible assets arising from the acquisition, construction or development and for normal operations of such assets. The Company accounts for income taxes using the asset and liability method in accordance with SFAS No. 109, Accounting for Income Taxes. The asset and liability method provides that deferred tax assets and liabilities are recognized for the expected future tax consequences of temporary differences between the financial reporting and tax bases of assets and liabilities, and for operating loss and tax credit carryforwards. Deferred tax assets and liabilities are measured using the currently enacted tax rates and laws that will be in effect when the differences are expected to reverse. The Company records a valuation allowance to reduce deferred tax assets to the amount that is believed more likely than not to be realized. On June 1, 2007, the Company adopted the provision of the FASB Interpretation No. 48, Accounting for Uncertainty in Income Taxes (FIN 48), an interpretation of the FASB Statement No. 109, Accounting for Income Taxes. FIN 48 prescribes a recognition threshold and measurement attribute for the financial statement recognition and measurement of a tax position taken or expected to be taken in a tax return. The interpretation requires the Company recognize the impact of a tax position in the financial statements if that position is more likely than not of being sustained on audit, based on the technical merits of the position. FIN 48 also provides guidance on de-recognition, classification, interest and penalties, and accounting in interim periods and disclosure. In accordance with the provisions of FIN 48, any cumulative effect resulting from a change in accounting principle is recorded as an adjustment to the opening deficit balance. As of May 31, 2008 and 2007, the Company did not have any amounts recorded pertaining to uncertain tax positions. The adoption of FIN No. 48 did not impact the Companys tax provision or the amounts recorded in the financial statements. The Company files federal and provincial income tax returns in Canada and federal, state and local income tax returns in the U.S., as applicable. The Company may be subject to a reassessment of federal and provincial income taxes by Canadian tax authorities for a period of three years from the date of the original notice of assessment in respect of any particular taxation year. For Canadian and U.S. income tax returns, the open taxation years range from 2007 to 2009. In certain circumstances, the U.S. federal statute of limitations can reach beyond the standard three year period. U.S. state statutes of limitations for income tax assessment vary from state to state. Tax authorities of Canada and U.S. have not audited any of the Companys, or its subsidiaries, income tax returns for the open taxation years noted above. The Company recognizes interest and penalties related to uncertain tax positions in tax expense. During the years ended May 31, 2009 and 2008, there were no charges for interest or penalties. The Companys functional and reporting currency is the United States dollar. Occasional transactions may occur in Canadian dollars and management has adopted SFAS No. 52, Foreign Currency Translation. Monetary assets and liabilities denominated in foreign currencies are translated using the exchange rate prevailing at the balance sheet date. Non-monetary assets and liabilities denominated in foreign currencies are translated at rates of exchange in effect at the date of the transaction. Average monthly rates are used to translate revenues and expenses. Gains and losses arising on translation or settlement of foreign currency denominated transactions or balances are included in the determination of income. The Companys financial instruments consist principally of cash, amounts receivable, accounts payable, accrued liabilities, loans payable, and amount due to related party. Pursuant to SFAS No. 157, the fair value of cash is determined based on Level 1 inputs, which consist of quoted prices in active markets for identical assets. The recorded values of all other financial instruments approximate their current fair values because of their nature and respective maturity dates or durations. The Company records stock-based compensation in accordance with SFAS No. 123R, Share Based Payments, using the fair value method. All transactions in which goods or services are the consideration received for the issuance of equity instruments are accounted for based on the fair value of the consideration received or the fair value of the equity instrument issued, whichever is more reliably measurable. The Company computes earnings (loss) per share in accordance with SFAS No. 128, "Earnings per Share". SFAS No. 128 requires presentation of both basic and diluted earnings per share (EPS) on the face of the income statement. Basic EPS is computed by dividing earnings (loss) available to common shareholders (numerator) by the weighted average number of shares outstanding (denominator) during the period. Diluted EPS gives effect to all dilutive potential common shares outstanding during the period using the treasury stock method and convertible preferred stock using the if-converted method. In computing diluted EPS, the average stock price for the period is used in determining the number of shares assumed to be purchased from the exercise of stock options or warrants. Diluted EPS excludes all dilutive potential shares if their effect is anti dilutive. SFAS No. 130, Reporting Comprehensive Income, establishes standards for the reporting and display of comprehensive loss and its components in the financial statements. As at May 31, 2009 and 2008, the Companys only component of comprehensive income (loss) was foreign currency translation adjustments. In June 2009, the Financial Accounting Standards Board (FASB) issued SFAS No. 168, The FASB Accounting Standards Codification and the Hierarchy of Generally Accepted Accounting Principles  a replacement of FASB Statement No. 162. The FASB Accounting Standards Codification (Codification) will become the source of authoritative U.S. generally accepted accounting principles (GAAP) recognized by FASB to be applied by nongovernmental entities. Rules and interpretive releases of the Securities and Exchange Commission SEC under authority of federal securities laws are also sources of authoritative GAAP for SEC registrants. On the effective date of this statement, the Codification will supersede all then-existing non-SEC accounting and reporting standards. All other non-grandfathered non-SEC accounting literature not included in the Codification will become non-authoritative. This statement is effective for financial statements issued for interim and annual periods ending after September 30, 2009. The adoption of this statement is not expected to have a material effect on the Companys financial statements. In June 2009, the FASB issued SFAS No. 167, Amendments to FASB Interpretation No. 46(R). The objective of this statement is to improve financial reporting by enterprises involved with variable interest entities. This statement addresses (1) the effects on certain provisions of FASB Interpretation No. 46 (revised December 2003), Consolidation of Variable Interest Entities, as a result of the elimination of the qualifying special-purpose entity concept in SFAS No. 166, Accounting for Transfers of Financial Assets, and (2) concern about the application of certain key provisions of FASB Interpretation No. 46(R), including those in which the accounting and disclosures under the Interpretation do not always provide timely and useful information about an enterprises involvement in a variable interest entity. This statement is effective as of the beginning of each reporting entitys first annual reporting period that begins after November 15, 2009, for interim periods within that first annual reporting period, and for interim and annual reporting periods thereafter. Earlier application is prohibited. The adoption of this statement is not expected to have a material effect on the Companys financial statements. In June 2009, the FASB issued SFAS No. 166, Accounting for Transfers of Financial Assets  an amendment of FASB No. 140. The object of this statement is to improve the relevance, representational faithfulness, and comparability of the information that a reporting entity provides in its financial statements about a transfer of financial assets; the effects of a transfer on its financial position, financial performance, and cash flows; and a transferors continuing involvement, if any, in transferred financial assets. This statement addresses (1) practices that have developed since the issuance of SFAS No. 140, Accounting for Transfers and Servicing of Financial Assets and Extinguishments of Liabilities, that are not consistent with the original intent and key requirements of that statement and (2) concerns of financial statement users that many of the financial assets (and related obligations) that have been derecognized should continue to be reported in the financial statements of transferors. SFAS No. 166 must be applied as of the beginning of each reporting entitys first annual reporting period that begins after November 15, 2009, for interim periods within that first annual reporting period and for interim and annual reporting periods thereafter. Earlier application is prohibited. This statement must be applied to transfers occurring on or after the effective date. Additionally, on and after the effective date, the concept of a qualifying special-purpose entity is no longer relevant for accounting purposes. The disclosure provisions of this statement should be applied to transfers that occurred both before and after the effective date of this statement. The adoption of this statement is not expected to have a material effect on the Companys financial statements. In May 2009, the FASB issued SFAS No. 165, Subsequent Events. SFAS No. 165 establishes general standards of accounting for and disclosure of events that occur after the balance sheet date but before financial statements are issued or are available to be issued. SFAS No. 165 is to be applied to interim and annual financial periods ending after June 15, 2009. The adoption of this statement is not expected to have a material effect on the Companys financial statements. In May 2008, the FASB issued SFAS No. 163, Accounting for Financial Guarantee Insurance Contracts  An interpretation of FASB Statement No. 60. SFAS No. 163 requires that an insurance enterprise recognize a claim liability prior to an event of default when there is evidence that credit deterioration has occurred in an insured financial obligation. It also clarifies how Statement 60 applies to financial guarantee insurance contracts, including the recognition and measurement to be used to account for premium revenue and claim liabilities, and requires expanded disclosures about financial guarantee insurance contracts. It is effective for financial statements issued for fiscal years beginning after December 15, 2008, except for some disclosures about the insurance enterprises risk-management activities. SFAS No. 163 requires that disclosures about the risk-management activities of the insurance enterprise be effective for the first period beginning after issuance. Except for those disclosures, earlier application is not permitted. The adoption of this statement is not expected to have a material effect on the Companys financial statements. In May 2008, the FASB issued SFAS No. 162, The Hierarchy of Generally Accepted Accounting Principles. SFAS No. 162 identifies the sources of accounting principles and the framework for selecting the principles to be used in the preparation of financial statements of nongovernmental entities that are presented in conformity with generally accepted accounting principles in the United States. SFAS No. 162 became effective on November 13, 2008 following the SECs approval of the Public Company Accounting Oversight Board amendments to AU Section 411, The Meaning of Present Fairly in Conformity With Generally Accepted Accounting Principles. The adoption of this statement did not have a material effect on the Companys financial statements. In March 2008, the FASB issued SFAS No. 161, Disclosures about Derivative Instruments and Hedging Activities  an amendment to FASB Statement No. 133. SFAS No. 161 is intended to improve financial standards for derivative instruments and hedging activities by requiring enhanced disclosures to enable investors to better understand their effects on an entity's financial position, financial performance, and cash flows. Entities are required to provide enhanced disclosures about: (a) how and why an entity uses derivative instruments; (b) how derivative instruments and related hedged items are accounted for under Statement 133 and its related interpretations; and (c) how derivative instruments and related hedged items affect an entitys financial position, financial performance, and cash flows. It is effective for financial statements issued for fiscal years beginning after November 15, 2008, with early adoption encouraged. The adoption of this statement is not expected to have a material effect on the Companys financial statements. In December 2007, FASB issued SFAS No. 141 (revised 2007), Business Combinations. This statement replaces SFAS No. 141 and defines the acquirer in a business combination as the entity that obtains control of one or more businesses in a business combination and establishes the acquisition date as the date that the acquirer achieves control. SFAS No. 141 (revised 2007) requires an acquirer to recognize the assets acquired, the liabilities assumed, and any noncontrolling interest in the acquiree at the acquisition date, measured at their fair values as of that date. SFAS No. 141 (revised 2007) also requires the acquirer to recognize contingent consideration at the acquisition date, measured at its fair value at that date. This statement is effective for fiscal years, and interim periods within those fiscal years, beginning on or after December 15, 2008 and earlier adoption is prohibited. The adoption of this statement is not expected to have a material effect on the Company's financial statements. In December 2007, the FASB issued SFAS No. 160, Noncontrolling Interests in Consolidated Financial Statements Liabilities an Amendment of ARB No. 51. This statement amends ARB 51 to establish accounting and reporting standards for the Noncontrolling interest in a subsidiary and for the deconsolidation of a subsidiary. This statement is effective for fiscal years, and interim periods within those fiscal years, beginning on or after December 15, 2008 and earlier adoption is prohibited. The adoption of this statement is not expected to have a material effect on the Company's financial statements. Certain of the figures presented for comparative purposes have been reclassified to conform to the presentation adopted in the current period. On February 27, 2007, the Company entered into a vend-in agreement whereby they agreed to acquire a 90% interest in four mineral licenses in central Labrador, Canada, comprised of 516 mineral claims covering an area of 33,111 acres. On February 28, 2007 the Company issued a $34,000 promissory note and 34,000,000 in common shares with a fair value of $340,000 to acquire this 90% interest. The purchase price included a total of $26,100 in refundable staking security deposits. These deposits were refunded to the Company in February 2008. As at May 31, 2009, the Company wrote off the mineral property acquisition costs of $348,000 due to the uncertainty of establishing proven and probable reserves. Under the terms of the vend-in agreement, the Company is committed to incurring mineral exploration expenditures of approximately $151,000 (Cdn$150,000) on or before March 1, 2008 (spent), $157,200 (Cdn$171,615) on or before March 1, 2009, and $196,500 (Cdn$214,519) on or before March 1, 2010 with the provision that any excess amount spent in one year may be carried forward and applied towards fulfilment of the expenditure requirements of a later year. As at May 31, 2009, the Company has spent $244,593 (Cdn$267,022) on exploration expenditures. These expenditures also qualify as exploration expenditures under the terms of the Companys mineral exploration licenses. Refer to Note 9(b). On May 17, 2007, the Company purchased a 90% interest in one mineral license in central Labrador, Canada, comprised of 6 claims covering an area of 371 acres for $321 (Cdn$360). As at May 31, 2009, the Company wrote off the mineral property acquisition costs of $321 due to the uncertainty of establishing proven and probable reserves. The mineral exploration licenses on the Companys properties are for a term of five years commencing at various dates from August 18, 2006 to May 17, 2007. These licenses may be renewed every five years for up to a maximum of twenty years provided annual assessment work is completed and reported, and license renewal fees of $20 (Cdn$22), $39 (Cdn$43) and $79 (Cdn$86) per claim are paid after five, ten and fifteen years, respectively. In order to maintain the property in good standing the Company is required to spend from $157 (Cdn$171) per claim in the first year to $943 (Cdn$1,029) per claim in the twentieth year. As at May 31, 2009, the Company owes $21,000 (2008 - $nil) for cash advances received which are non-interest bearing, unsecured and due on demand. As at May 31, 2009, the Company owes $15,000 (2008  $nil) for a cash advance received which is non-interest bearing, unsecured and due on demand. Refer to Note 9. As at May 31, 2009, the Company owes $14,915 (Cdn$16,283) (2008 - $nil) to the President of the Company which is non- interest bearing, unsecured and due on demand. Between February and May 2008, 1,100,000 common shares at $0.10 per share for proceeds of $110,000 were subscribed for. The shares were issued in June 2008. On November 2, 2007, the Company repaid share subscriptions of $1,000 which were received in March 2007. On October 5, 2007, the Company issued 1,000,000 common shares at $0.10 per share for proceeds of $100,000. On September 8, 2007, the Company issued 2,890,000 common shares at $0.10 per share for proceeds of $289,000. On September 7, 2007, the Company issued 2,000,000 common shares at $0.10 per share for proceeds of $20,000. On July 31, 2007, the Company issued 2,550,000 common shares at $0.01 per share for proceeds of $25,500. On June 30, 2007, the Company issued 6,890,000 common shares at $0.01 per share for proceeds of $68,900. On January 31, 2007, the Company entered into a consulting agreement with a company whereby it has agreed to pay $10,000 per month and issue a bonus of 5% of the common shares in the event of the discovery of a major commercially viable mineral resource deposit. The contract does not terminate until minimum term ending on February 28, 2010. The Company has net operating losses carried forward of $859,007 available to offset taxable income in future years which expires beginning in fiscal 2026. Subsequent to year end, the Company received stock subscriptions of $45,000. The Company is to issue 1,500,000 shares at $0.03 per share. The proceeds were used for working capital purposes and to repay the $15,000 loan payable as disclosed in Note 4(b). On August 27, 2009, the vend-in agreement described in Note 3(a) was amended in that the optionor has agreed to waive the remaining required work commitments on the mineral properties subject to the Company incurring sufficient exploration expenditures on the properties to keep them in good standing with the local government. There were no disagreements related to accounting principles or practices, financial statement disclosure, internal controls or auditing scope or procedure during the two fiscal years and interim periods, including the interim period up through the date the relationship ended with Mendoza Berger & Company, LLP. We maintain disclosure controls and procedures that are designed to ensure that information required to be disclosed in our reports filed under the Securities Exchange Act of 1934, as amended, is recorded, processed, summarized and reported within the time periods specified in the Securities and Exchange Commission's rules and forms, and that such information is accumulated and communicated to our management to allow for timely decisions regarding required disclosures. As at May 31, 2009, the end of the year covered by this annual report, our Chief Executive Officer and Chief Financial Officer carried out an evaluation of the effectiveness of the design and operation of our disclosure controls and procedures. Based on the foregoing, our Chief Executive Officer and Chief Financial Officer concluded that our disclosure controls and procedures were not effective as of the end of the period covered by this annual report. There have been no changes in our internal control over financial reporting during the year ended May 31, 2009 that have materially affected, or are reasonably likely to materially affect our internal control over financial reporting. This annual report does not include a report of management's assessment regarding internal control over financial reporting or an attestation report of the Company's independent registered public accounting firm due to a transition period established by rules of the Securities and Exchange Commission for newly public companies. ineffective controls over period end financial disclosure and reporting processes. oversight in the establishment and monitoring of required internal controls and procedures can result in our detriment to our financial statements for the future years. We are committed to improving our financial organization. As part of this commitment, we intend to create a position when funds are available to us to segregate duties consistent with control objectives and will increase our personnel resources and technical accounting expertise within the accounting function: i) appointing one or more outside directors to our board of directors who will also be appointed to the audit committee of our company resulting in a fully functioning audit committee who will undertake the oversight in the establishment and monitoring of required internal controls and procedures; and ii) preparing and implementing sufficient written policies and checklists that will set forth procedures for accounting and financial reporting with respect to the requirements and application of US GAAP and SEC disclosure requirements. Management believes that the appointment of one or more outside directors, who will also be appointed to a fully functioning audit committee, will remedy the lack of a functioning audit committee and a lack of a majority of outside directors on our board of directors. In addition, management believes that preparing and implementing sufficient written policies and checklists will remedy the following material weaknesses: (i) insufficient written policies and procedures for accounting and financial reporting with respect to the requirements and application of US GAAP and SEC disclosure requirements; and (ii) ineffective controls over period end financial close and reporting processes. Further, management believes that the hiring of additional personnel who have the technical expertise and knowledge will result proper segregation of duties and provide more checks and balances within the department. Additional personnel will also provide the cross training needed to support our company if personnel turn over issues within the department occur. This coupled with the appointment of additional outside directors will greatly decrease any control and procedure issues we may encounter in the future. Management will continue to monitor and evaluate the effectiveness of our internal controls over financial reporting on an ongoing basis and are committed to taking further action and implementing additional enhancements or improvements, as necessary and as funds allow. The following is a brief account of the education and business experience of each director and executive officer during at least the past five years, indicating each person's principal occupation during the period, and the name and principal business of the organization by which he was employed. Mr. Costerd has acted as Wolverines sole Director and Officer since its inception on February 23, 2006. Mr. Costerd has been involved in the mining industry for the past 20 years. Mr. Costerd was the mine manager for a placer mining operation in British Columbia and a supervisor at a hard rock mining operation also in British Columbia. There are no family relationships among our directors or officers. Commission initial statements of beneficial ownership, reports of changes in ownership and annual reports concerning their ownership of our common stock and other equity securities, on Forms 3, 4 and 5 respectively. Executive officers, directors and greater than 10% shareholders are required by the SEC regulations to furnish us with copies of all Section 16(a) reports that they file. Based solely on our review of the copies of such forms received by us, or written representations from certain reporting persons, we believe that during fiscal year ended May 31, 2009, all filing requirements applicable to our officers, directors and greater than 10% percent beneficial owners were complied with. We do not have an audit committee; our entire board of directors performs the function of an audit committee. Our board of directors has determined that it does not have a member that qualifies as an "audit committee financial expert" as defined in Item 407(d)(5)(ii) of Regulation S-K, and is "independent" as the term is used in Item 7(d)(3)(iv) of Schedule 14A under the Securities Exchange Act of 1934, as amended. We believe that the members of our board of directors are collectively capable of analyzing and evaluating our financial statements. We believe that retaining an independent director who would qualify as an "audit committee financial expert" would be overly costly and burdensome and is not warranted in our circumstances given the early stages of our development and the fact that we have not generated any material revenues to date. In addition, we currently do not have nominating, compensation or audit committees or committees performing similar functions nor do we have a written nominating, compensation or audit committee charter. Our board of directors does not believe that it is necessary to have such committees because it believes the functions of such committees can be adequately performed by our board of directors. We adopted a Code of Ethics applicable to all of our directors, officers, employees and consultants, which is a "code of ethics" as defined by applicable rules of the SEC. Our Code of Ethics is attached as an exhibit to our registration statement on Form S-1 filed on July 15, 2008. If we make any amendments to our Code of Ethics other than technical, administrative, or other non-substantive amendments, or grant any waivers, including implicit waivers, from a provision of our Code of Ethics to our chief executive officer, chief financial officer, or certain other finance executives, we will disclose the nature of the amendment or waiver, its effective date and to whom it applies in a Current Report on Form 8-K filed with the SEC. Consulting fees of $27,145 have been paid and/or accrued to Mr. Costerd. Mr. Costerd received an aggregate of $28, 222 in management fees. During the period from inception (February 23, 2006) to May 31, 2009, we did not grant any stock options to our executive officers. There were no options exercised during our fiscal year ended May 31, 2009 or May 31, 2008 by any officer or director of our company. No equity awards were outstanding as of the year ended May 31, 2009. We reimburse our directors for expenses incurred in connection with attending board meetings. We have not paid any director's fees or other cash compensation for services rendered as a director since our inception to May 31, 2009. We have no formal plan for compensating our directors for their service in their capacity as directors, although such directors are expected in the future to receive stock options to purchase common shares as awarded by our board of directors or (as to future stock options) a compensation committee which may be established. Directors are entitled to reimbursement for reasonable travel and other out-of-pocket expenses incurred in connection with attendance at meetings of our board of directors. Our board of directors may award special remuneration to any director undertaking any special services on our behalf other than services ordinarily required of a director. No director received and/or accrued any compensation for their services as a director, including committee participation and/or special assignments. We have not entered into any employment agreement or consulting agreement with our directors and executive officers. discretion of our board of directors in the future. We do not have any material bonus or profit sharing plans pursuant to which cash or non-cash compensation is or may be paid to our directors or executive officers, except that stock options may be granted at the discretion of our board of directors. We have no plans or arrangements with respect to remuneration received or that may be received by our executive officers to compensate such officers in the event of termination of employment (as a result of resignation, retirement, change of control) or a change of responsibilities following a change of control, where the value of such compensation exceeds $60,000 per executive officer. The following table sets forth, as of September 29, 2009, certain information with respect to the beneficial ownership of our common stock by each stockholder known by us to be the beneficial owner of more than 5% of our common stock and by each of our current directors and executive officers. Each person has sole voting and investment power with respect to the shares of common stock, except as otherwise indicated. Beneficial ownership consists of a direct interest in the shares of common stock, except as otherwise indicated. by more than one person (if, for example, persons share the power to vote or the power to dispose of the shares). In addition, shares are deemed to be beneficially owned by a person if the person has the right to acquire the shares (for example, upon exercise of an option) within 60 days of the date as of which the information is provided. In computing the percentage ownership of any person, the amount of shares outstanding is deemed to include the amount of shares beneficially owned by such person (and only such person) by reason of these acquisition rights. As a result, the percentage of outstanding shares of any person as shown in this table does not necessarily reflect the persons actual ownership or voting power with respect to the number of shares of common stock actually outstanding on September 29, 2009. As of September29, 2009, there were 68,630,000 shares of our companys common stock issued and outstanding. Except as disclosed herein, there have been no transactions or proposed transactions in which the amount involved exceeds the lesser of $120,000 or one percent of the average of our total assets at year-end for the last three completed fiscal years in which any of our directors, executive officers or beneficial holders of more than 5% of the outstanding shares of our common stock, or any of their respective relatives, spouses, associates or affiliates, has had or will have any direct or material indirect interest. The promoter of our company is our sole directors and officer. We currently act with one director, consisting of Mr. Lee Costerd. We have determined that we do not have a director that qualifies as an independent director as defined in NASDAQ Marketplace Rule 4200(a)(15). We do not have a standing audit, compensation or nominating committee, but our entire board of directors act in such capacity. We believe that our directors are capable of analyzing and evaluating our financial statements and understanding internal controls and procedures for financial reporting. Our directors do not believe that it is necessary to have an audit committee because we believe that the functions of an audit committee can be adequately performed by the board of directors. In addition, we believe that retaining additional independent directors who would qualify as an audit committee financial expert would be overly costly and burdensome and is not warranted in our circumstances given the early stages of our development. Paid to Mendoza Berger & Company LLP. Paid to Saturna Group Chartered Accountants LLP. Articles of Incorporation of Wolverine Exploration Inc. filed as an Exhibit to our Form S-1 (Registration Statement) on July 15, 2008, and incorporated herein by reference. Bylaws of Wolverine Exploration Inc., filed as an Exhibit to our Form S-1 (Registration Statement) on July 15, 2008, and incorporated herein by reference. Certificate of Amendment of Wolverine Exploration Inc., filed as an Exhibit to our Form S-1 (Registration Statement) filed on July 15, 2008 and incorporated herein by reference. Certificate of Registration of Extra-Provincial Corporation, filed as an Exhibit to our Form S-1 (Registration Statement) filed on July 15, 2008 and incorporated herein by reference. Vend-In Agreement dated February 28, 2007 between Wolverine and Shenin Resources Inc., filed as an Exhibit to our Form S-1 (Registration Statement) filed on July 15, 2008 and incorporated herein by reference. Consulting Agreement dated January 31, 2007 between Wolverine and Texada Consulting Inc., filed as an Exhibit to our Form S-1 (Registration Statement) filed on July 15, 2008 and incorporated herein by reference. Additional Property Agreement dated May 17, 2007 among Wolverine, Shenin Resources Inc. and Richard Haderer, filed as an Exhibit to our Form S-1 (Registration Statement) filed on July 15, 2008 and incorporated herein by reference. Code of Ethics, filed as an Exhibit to our Form S-1 (Registration Statement) filed on July 15, 2008 and incorporated herein by reference.